Ranofer, an orphan, lives with his older half-brother, Gebu, who is abusive, untrustworthy, and dangerous. Though Ranofer wants nothing more than to make beautiful items of gold, Gebu will not allow him to be apprenticed to a goldsmith, nor does he provide him with adequate food or shelter. When Ranofer learns that Gebu's activities are even more sinister than he suspected, he and his friends Heqet and the Ancient, try to expose his wrongdoing and win Ranofer the right to choose his own destiny. The Golden Goblet refers to an object which is central to a mystery Ranofer must solve in order to bring his evil half-brother to justice. The mystery requires a good bit of backstory, and thus takes a while to gain momentum, but the chapters of exposition are truly necessary to provide the reader with enough information about Ranofer's world to understand the actions he takes in the latter half of the story. Though the story is narrated in the third person, it is limited to Ranofer's perspective so his every worry, joy and secret are freely available to the reader, as are his intimate thoughts about his friends and the rare opportunities he has to work with gold. While the mystery is central to the plot, the overarching themes of the story have to do with courage, coming of age and doing the right thing. Clear distinctions are drawn between good and evil, and Ranofer must make hard high-stakes decisions to secure the future he wishes for himself. Though the setting is long ago and far away for young readers, the storyline is timeless and universal. The Golden Goblet lacks any author's note or bibliography which might have provided insight into what is historical fact and which details the author invented. Therefore, it is recommended that young readers assigned this book for specific educational purposes be provided with information about Egyptian culture as part of their lesson. 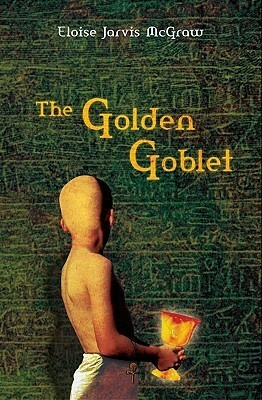 The Golden Goblet would make wonderful pleasure reading for kids who have become interested in Egypt because of Rick Riordan's Kane Chronicles. As compared with Riordan's commercial fluff, this book is well-written, morally edifying, and heavily rooted in historical fact. The content is probably appropriate for readers as young as eight or nine, if they read well and are not troubled by the occasional descriptions of Gebu hitting Ranofer, but the target audience seems to be middle school, when issues of identity and finding one's place are so central to a young person's life. I think we own a copy of this. I am going to look for it now and read it - if I find it! Looking forward to these weekly reviews.